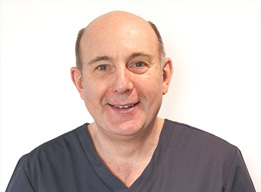 David graduated from Liverpool University in 1981 and bought into the Stratford practice in 1983 after experience in general practice and the Community Dental Service elsewhere in Warwickshire. He then bought the Wellesbourne practice in 1985. Since then he alongside his wife Anne-Louise has been responsible for the considerable expansion and development of both practices. Always keen to keep up to date with new ideas and techniques he has been on numerous postgraduate courses. He spent three years as a Clinical Assistant in Orthodontics at Warwick Hospital and spent a year on a Multi-system Implant course in Manchester. As a result he introduced Fixed Orthodontics and Implant Dentistry to the practices. He is also very keen on staff training and development. He has helped in the establishment of Arden Dental Training. Over many years he has been involved in the training of new dental graduates in the West Midlands region and continues to be actively involved with the continuing education and personal development of fellow clinicians and staff with in the practice. He has been a member of the Society for the Advancement in Anaesthesia in Dentistry (SAAD) for over 30 years, is a member of the Royal College of Dental Surgeons, a member of the International Team for Implantology and a member of the British Dental Bleaching Society (tooth whitening). Outside dentistry he enjoys squash, walking, cycling and sailing as well as being actively involved with his family.